Clifford Brown’s “Daahoud” sets the mood early. It is indeed a different feeling to hear multiple flutes as a group in a jazz setting. The music is just like a typical big band, except that it’s all flutes instead of the usual combination of trumpets, trombones and saxophones. Lieberman is featured soloist. The band’s rendition of Oliver Nelson’s “Stolen Moments” is beautifully done. Melodically, it is what you might expect in how it’s played. But to hear an orchestra of flutes puts a unique stamp on it. Special guest Hubert Laws on alto flute is featured soloist. Dizzy Gillespie’s “Con Alma” is the longest piece in the set at nearly nine minutes. Special guest Nestor Torres on C flute is featured soloist. Tana’s percussive nuances help punctuate the piece. There’s one passage where Reid’s bass is in lockstep with the flutes, where in all 17 pieces are playing the same notes. The band also takes on compositions by Wayne Shorter, Herbie Hancock, Neal Hefti, Gabriel Faure, John Coltrane and Tom Harrell. Game Changer was a long time coming. In 2002, Ryerson established flute master classes at Carmel Valley, California’s Hidden Valley Music Seminars. This was after she’d met promising jazz flutists who weren’t getting recognition they deserved because of the atypical instrument they focused on. That eventually led to her creating the Jazz Flute Big Band in 2005. In 2009, she spoke to Capri Records president Tom Burns about recording the band. In October 2012, the session was done over two days. 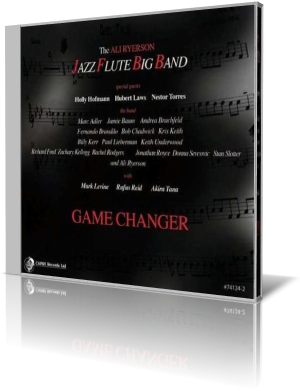 The result is a satisfying collection of big band jazz music – with no brass.